Ben Cartwright of Lexington Park, Maryland passed away at home on April 7, 2019 after a long illness. Ben served his country proudly for 22 years, 9 months, and 3 days in the United States Navy. 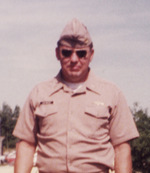 He retired as a Senior Chief and settled with his family in Lexington Park, Maryland, where he worked for the Department of Defense as a civil servant with NAVAIR for 19 years. Ben was preceded in death by his parents, Edward Vernon and Betty Cartwright. He is survived by his loving wife of over 50 years, Janatha Cartwright, brother Michael and wife Rose of Kansas, brother Tom of Oklahoma, son Andrew (Hailey and Liliana) of Leonardtown, MD, and daughter Amy and husband Jake Bachman (Caleb) of Pennsylvania, along with numerous nieces, nephews, and cousins. In addition to family, Ben was blessed with a caretaker for the past 15 months, Robyn Inks, who brought light and laughter to he and Jan during a very difficult time. Ben loved the military and trains. He was a life-long model railroader. He traveled extensively during his time in the Navy, with duty stations in Tennessee, Maryland, and Maine, while he served on multiple overseas deployments. Ben and Jan were together for over 50 years, having just celebrated their 50th anniversary this past August. When he was unable to go out shopping and do things to surprise her, Ben always found a way to make her feel special on holidays and her birthday. The family will receive friends on Friday, April 12, 2019 from 1:00 Pm to 2 Pm in the Mattingley-Gardiner Funeral Home Leonardtown, MD. A Funeral Service will follow at 2Pm with Clarence Colvin officiating. Interment will be private. To send flowers to the family of Edward Bennett "Ben" Cartwright, please visit our Heartfelt Sympathies Store.